Ultrasonic Algae Control - Does It Really Work? Home > Ultrasonic Algae Control - Does It Really Work? Do UltraSonic Algae Control Systems Live Up To Their Claims? This is our experience, dating back over ten years now, with using ultrasonic sound waves for algae control in ponds, lakes, and industrial settings. Be sure to review our latest updates at the bottom of this report. 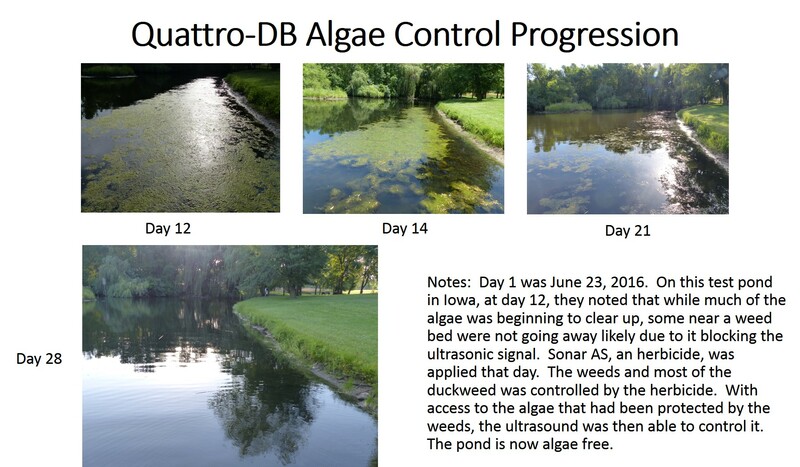 Late in the summer of 2006 and into the spring and summer of 2007 we began getting questions about using ultrasonic waves for pond algae control. Some pond owners thought it was a great idea overall but had concerns about what it might do to fish or other aquatic wildlife and really wondered if it worked. Other owners wrote to us about the use of beneficial bacteria products and in their feedback indicated that they were using a sonic system with very good affect. This fact peaked our interest in the product as well since KLM Solution's business and philosophy is based on using non-chemical algae controls whenever possible. And it appeared that the sonic systems would fit into that model. One thing that's true of all the products we sell is that we don't market or suggest the use of something we have not had success with ourselves. So one of our first priorities was to test out a brand of sonic algae control and compare our results to the claims that surround these units. In late May of 2007 we decided to do several short run tests on ponds measuring approximately 1/2 acre or less in size. We wanted to evaluate how the sonic treatment worked on not only green water, but also string algae and other mass types of growth. Although we decided to test out a mid-range unit for a 1/2 acre pond, there are systems available that have been used to treat small water garden and koi ponds (but we no longer recommend them for small ponds) and others up to multi-acre lakes. We were particularly interested in the large water capacity models since treating these types of ponds with additives can get very expensive over time. Each sonic system, regardless of it's recommended pond capacity, is made up of several parts. There is an electronic box that is land based and plugs into an electrical outlet. A transducer cable connects the electronics with the transducer or "emitter" that actually goes in the water. 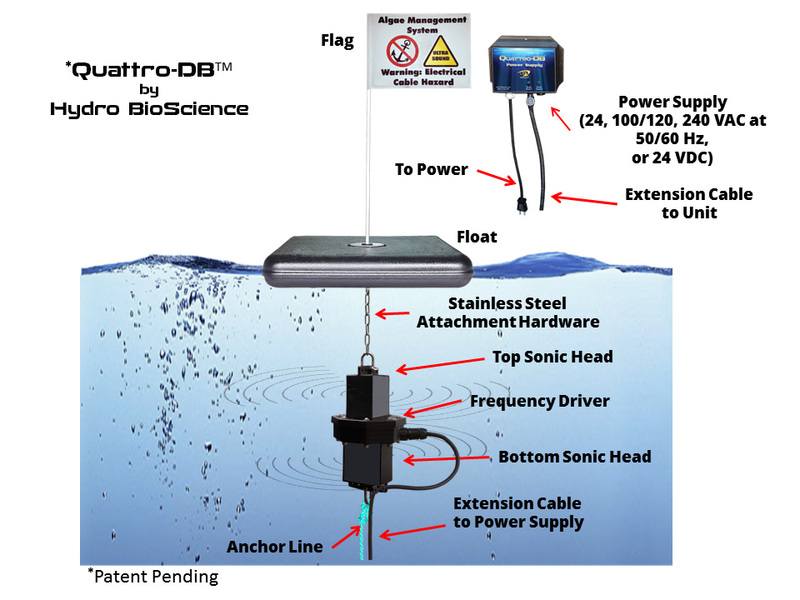 In the larger units the transducer is suspended under a float to keep it at the correct depth. 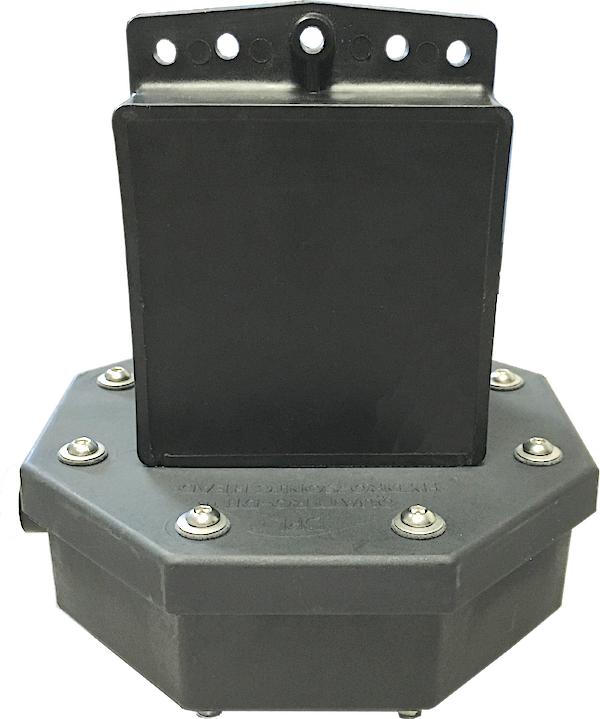 For smaller ponds the transducer is simply lowered into the water. This is one aspect we liked a lot. The unit is very easy to install in even the largest ponds. You simply need to get the emitter into the water and have it point out from a corner of the pond. Plug it in and it begins working. Other very positive things that came away from our testing was the fact that the product seemed to work very well on green water, or planktonic algae and it did not appear to affect the fish at all. In terms of green water elimination the sonic system worked quite quickly. Usually after a few days of running the unit the water was much clearer. It makes sense in a way that this would be the case. UltraSonic algae control uses sound waves at specific vibrational frequencies. Like an opera singer can hit just the right pitch to break a wine glass, the ultrasonic vibrations pass through the water in an all around pattern causing the vacuoles inside the algae cells to resonate and break. It's in this way that the unit actually kills or damages the algae. Since green water is made up of many, very small individual algae cells, the sonic wave cuts through this growth very quickly. String algae on the other hand is very dense and it can take more time for the sonic sound waves to work it's way through this thicker mass. It will continually work to damage the "outer wall" off the algae growth and slowly work to eliminate the algae over time. One of our big concerns early on was what affect the device might have on fish. We're happy to report that we couldn't find any indication that the fish were bothered by the sonic waves at all. In most applications they swam up to it, looked it over, then swam away in an unhurried fashion. This observation, which we quite frankly, trust more than anything one might read, does back up the scientific reports that the product is safe for aquatic wildlife. Is this the perfect tool for algae control? So is sonic algae control the best remedy for algae in a pond? This system has quite a few advantages and benefits. It's relatively easy to install. It's one of the most cost effective algae treatments for large ponds and multi-acre lakes. It works quickly on green water in most cases and including many toxic algae blooms. Kills root parasitic fungi like Pythium and Fusarium (in water). Low power consumption (from 7 to 12 watts); Solar Capable. But sonic algae control isn't the one stop solution to algae control. It really should be looked at as one tool in an arsenal of options, either alone or in combination that can help rid a pond of algae. Sonic devices attack algae growth directly but they are limited in what they can do for the aquatic environment. Pond aeration will always be one of the most useful ways to add oxygen to a pond system which benefits the fish and the pond greatly. For smaller ponds, adequate filtration is an absolute, particularly if you have fish. If you've used or are using beneficial bacteria products which are highly recommended for helping reduce organic sedimentation in a pond, the sonic system works well with that as well. In a sense, the sonic waves help to stimulate a hyper activity in the bacteria which helps them perform better and more efficiently. So, on it's own, a sonic system won't add oxygen to the pond, filter the water, or work like beneficial bacteria to clean the pond bottom up (although it will help any existing bacteria to do so). We also found that, while we try to keep things simple and categorize algae in three main types (planktonic or green water, string, and floating mat or scum) the fact is there are many other types and species as well. Macrophytic algae which includes plants like Chara make up another family of algae altogether. There are actually thousands of species of algae that come in a variety of forms and colors. And other aquatic weeds such as duckweed or milfoil which can affect a lot of ponds throughout the U.S..
Our findings indicate that the sonic systems won't kill them all and in other cases it may take longer to eliminate certain species from the water. Chara for instance, will not be harmed by a sonic wave, and other plants like duckweed are resistant as well. As we mentioned earlier, filamentous or string algae is often found in thick clumps or masses. When you have algae like this and treat it with a sonic system, be prepared to wait awhile. It's not a quick fix. Our findings showed that it may take several months before the device can work it's way through the growth and it wasn't uncommon for the pond to look a bit worse before it started to appear better. Also, odd or irregular shaped ponds may be harder to treat with the system. Although the units will emit sound waves over a 180 degree radius the sonic wave must have a direct line to the algae mass to kill it. Obstructions like small islands will block or divert the wave which can lessen it's effect. Mechanical devices like fountains or aerators don't appear to cause any problems. The good news is that once the algae was successfully reduced, it did not regrow. We think the same could be said for treating a pond early in the season before algae starts to develop. With a sonic system in place a pond owner will likely keep algae down if they get a jump on it. As noted earlier, most green water issues were dealt with quite readily. Normally in less than a week the pond appeared to be clearer and the treatment was not affected by a high pH reading in the test pond. How do you know if the ultrasonic algae control will work in your pond? Simply said, with the naked eye you probably won't know for sure. It's safe to say that your odds of success are still pretty good as the sonic system we tried worked in most of the more common algae types we see in the Midwest, apart from the more plant like Macrophytic types. In the end, we haven't found any preliminary test that can be 100% accurate, however actually running a system in a pond for about 60 days will provide conclusive proof of whether the technology will work appropriately for your needs. To conclude this report on the ultrasonic algae control systems, we found that the products do work well on certain types of algae. They have the ability to limit or eliminate the use of any chemical applications to a pond, which we're totally in favor of. You may still want to use underwater aeration or a beneficial bacteria product in conjunction with the sonic systems since they serve other purposes that the sonic treatment cannot. On a positive note, all of these applications do work well together. In smaller ponds, things like UV filtration and Bio-filters will work fine with a sonic treatment. Other issues such as a very high or low pH which can affect bacteria treatments will not impede the sonic systems. In some cases, treating with the sonic device may also lower the pH a bit. So UltraSonic algae treatments are versatile and can work in a variety of ponds and water applications. In most cases the units are sized according to the surface area of the pond being treated. Over the last 10 years or so, we've seen several brands and models of ultrasound systems come onto the market. All of them have worked, to some extent, to help with algae reduction in ponds, waste water operations, and other industrial settings. We've worked with, or studied most of the top brands and in later years, we began to look at other factors, such as the country of origin, or manufacture, frequency densities, and overall reliability. We concluded we wanted to work with American made devices. And perhaps more importantly we wanted to insure that if any repairs ever had to be made, they could be done here in the states. In the past, in some instances, owners would have to ship devices to Europe for repairs. It should go without saying that reliability is very important, and with our original product line, some circuit boards were problematic. So we ended up switching to the first brand of ultrasounds made in the US, which had a more dense frequency range (79 vs 16), and we carried this line for seven years. For the most part, performance was good with about a 75% success rate, mostly due to the frequency improvements. Reliability was good, but not entirely without a few problems. Most concerning though, was a general stagnation in developing out the technology, in any appreciable way. Other than some minor modifications to limit breakdowns (which is still a good thing), there was no significant work to improve the performance on algae species. This is all changing for 2017! What you're looking at in the above illustration is the all new Quattro DB ultrasound system. In our review, it's, by far, the most advanced ultrasonic algae control device currently available for the consumer. Green Algae and Diatom Algae Control Range: 150 meters radially from the device or about 17.5 acres. Blue-green Algae with gas vesicles Control Range: 400 meters radially from the device or about 124 acres. Here's a few things to note. Remember, we made the switch some years ago when the frequency density improved from 16 to 79, which was monumental at the time. Why? Because the closer you can match the resonant frequency of the algae cell, the more vibration you'll create in it, and the more damage you'll do. Often, close, is good enough for reasonable control. But to maximize the control and performance you need to match those resonant frequencies. And with the Quattro DB, we see an increase in frequency density from 79 to a massive 2024 per cycle using dual bandwidth ranges! The effective control range has also been increased substantially over any existing ultrasound system due to the 360 degree coverage of the Quattro-DB. Historically there would be a handful of models and sizes to fit various ponds. That's now been reduced to just two distinct units. The Quattro is the larger of the two new systems being introduced. For smaller ponds, the single directional Mezzo will cover ponds up to about 2+ acres in size. Both systems now use variable length power cables, much like you would see used on a pond fountain. As well, an all new solar package is available that works great in really large ponds and lakes. All in all, we expect to see better control of a wider array of algae types, improved performance and range, and lower costs to the pond owner by making the switch.